The newest approach to the New York Times bestselling DASH diet, featuring a completely new approach to eating, the latest science and research on improving heart health and reducing the risk of diabetes, and a Mediterranean diet-inspired meal plan to make this the most healthful and effective DASH diet ever. The DASH diet has been a staple of the dieting world, recommended by doctors, nutritionists, and crowned the US News and World Report's #1 best diet for 8 years in a row. But popular tastes and medical guidelines have evolved, and THE DASH DIET MEDITERRANEAN SOLUTION presents a new approach to the time tested diet program that highlights the benefits of whole foods. Marla Heller, MS RD has overhauled the DASH plan to reflect the latest, cutting-edge research on hypertension, diabetes, depression, and other health issues that impact millions of Americans. Meal planning gets a new focus on unprocessed foods (less sugar free jello, more fresh fruits! ), seafood options, and even a whole section examining vegan and vegetarian choices. 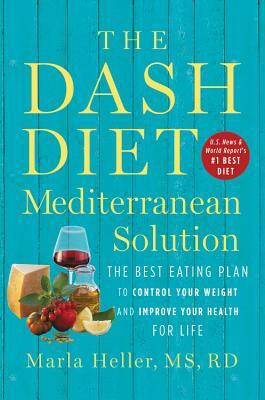 Filled with four weeks of menus and tons of strategies and research, THE DASH DIET MEDITERRANEAN SOLUTION offers readers a new approach to their best health the DASH diet way. Marla Heller is a Registered Dietitian, and holds a Master of Science in Human Nutrition and Dietetics from the University of Illinois at Chicago. She was trained in DASH by one of the original architects of the original NIH research and has been working for over 15 years to help her patients put DASH into practice. Heller has been the featured nutrition expert for the Chicago Tribune and Washington Post and she is a spokesperson for the Greater Midwest Affiliate of the American Heart Association. She is the author of New York Times bestsellers The DASH Diet Younger You, The DASH Diet Action Plan, and The Everyday DASH Diet Cookbook.